This time of year is slightly problematic for chilli growers that ski; two things that aren't exactly compatible, unless you have a heated greenhouse and live near a ski resort. 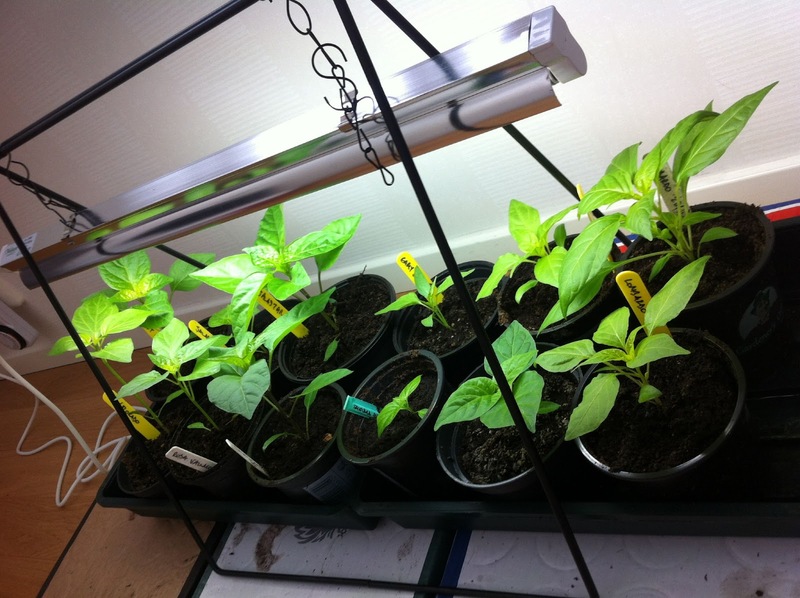 Each spring, every inch of space under the grow lamps is jam packed with beautiful, flourishing green, albeit very small, chilli plants. Plants that I haven't left alone for more than a few hours (an advantage of working from home). How then am I supposed to just up and leave for a week? Completely forget about them as I whizz about on the ski slopes, laze around in the spring sunshine with a yummy glass of wine and lounge around by the fire with a good book? I have an extra grow lamp this year, so they weren't quite as squashed up, i.e. light wasn't a problem. But watering was worrying me. I eventually decided on the re-pot and drown-them tactic. And it worked! :) Yay. But look at the size of them! 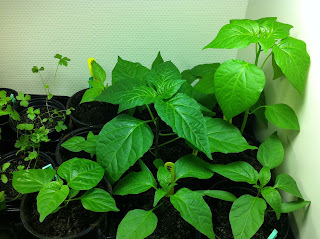 :) The healthy chap in the middle is a Purple Serrano and the lanky one is an Aji Colorado. Two favourites in our kitchen. 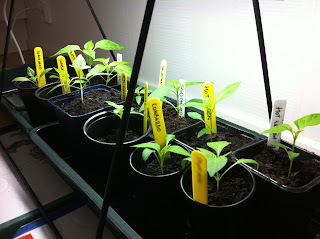 Im amazed how well grown your plants are.I have sown Jalapeno seeds,and Scotch Bonnett. 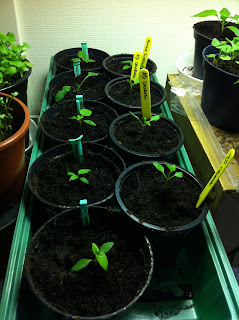 Im trying to germinate them in the warmth of the conservatory but so far nothing.I must be patient..
What will you do with all your Chilli's once they fruit for you?